Born in Padua, he attended the course of orchestra conduction under the masters Dimitri Mitropoulos and Franco Ferrara, and reached a worldwide reputation on the pulpit as symphonic and opera conductor working at Covent Garden in Londra, at the "Arena" Theatre in Verona, at "La Fenice" Theatre in Venezia, for the Opera House of Rome at the Thermae of Caracalla, at the Rossini Opera Festival in Pesaro, at the Opera House of Zurich, New York, Paris, Macerata ("Sferisterio"), Houston, Melbourne, Aspen, etc. He conducted as well, during concerts or during recordings, the Philarmonia and the Royal Philharmonic of London, the Orchestras of the French Radio in Paris, the New York Mostly Mozart Orchestra and the New Japan Philharmonic of Tokyo, the Yomiuri Symphony Orchestra and the Bamberger Symphoniker, the English Chamber Orchestra, the Sydney Symphony, the Salzburger Mozarteum Orchestra and many others, from Toulouse to Strasburg, and from Montreal to Ottawa, Houston and Dallas, etc. 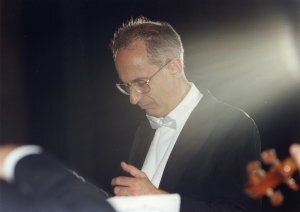 He is honorary conductor of the Gulbenkian Orchestra of Lisbon. He has the merit of having executed the first modern unabridged performances (and the relevant CD or DVD records) of many works of Rossini, such as "Mosè in Egitto", "Maometto II"(in both Neapolitan and Venetian versions, this last one on occasion of the opening celebrations of the newly restored Theatre La Fenice), "Edipo a Colono" (all these works for the "Rossini Opera Festival" of Pesaro) "Zelmira", "Armida", "Ermione", the Opera "L'Italiana in Algeri" (this performance with I Solisti Veneti, Marylin Horne, Sam Ramey, Kathleen Battle won the Los Angeles Grammy Award in 1980), as well as many others among which "Le jugement dernier" by Salieri, "Il Nascimento dell'Aurora" and "Pimpinone" by Albinoni, "La caduta di Adamo" by Galuppi, etc. The important premières" of "Orlando Furioso" by Vivaldi (Verona, Teatro Filarmonico" and Paris, Châtelet, with I Solisti Veneti, Marylin Horne, and Victoria de Los Angeles, under the direction of Pierluigi Pizzi) let the world to know the greatness of theatrical production of Antonio Vivaldi. In 1959 he established in Padua the Group of I Solisti Veneti, that are going to celebrate during 2009 their 50th anniversary, and that rapidly became the Orchestra of Chamber Music most famous in the world, performing more than 5.500 concerts in more than 80 countries and in main International Music Festivals (among all, they held more than 30 concerts at Salzburg Festival), they recorded more than 350 works in CD, LP, DVD and publishing a very wide range of issues besides many cultural, educational and promotional activities. With Scimone, I Solisti Veneti have been habitual guests of the major Italian and foreign broadcasts, but also they participated to some of the most important films and TV programmes about music, such as "Vivaldi, the music painter" by François Reichenbach and "The Last Seven Words of Christ" with the music of F. J. Haydn, directed by Ermanno Olmi in the Chapel of Scrovegni by Giotto. The discography of Scimone is very wide and it counts more than 350 titles for the major record companies world-wide (Erato - WEA, Philips, BMG - RCA, etc.) and together with the various above mentioned Orchestras, not to mention, of course, I Solisti Veneti. With I Solisti Veneti he recorded also the unabridged edition of the works of Vivaldi and Albinoni published during lifetime, the Symphonies of Mozart, and he brought to international success some masterpieces by big but forgotten compositors such as Giannella, Mercadante, Rolla, and others. Recently, the DVD collection by I Solisti Veneti "Le Stagioni di Vivaldi nelle Ville Venete" (Arthaus), "Il Gloria e la musica sacra di Antonio Vivaldi in San Marco a Venezia e nella Cappella di Giotto a Padova" (Dynamic) and, in 2008, "Concerti per flauto e orchestra di Vivaldi nel Palazzo Ducale di Venezia" with James and Jeanne Galway (Hardy Classic). Together with I Solisti Veneti, from more than 40 years, Scimone performs a very important action in order to divulgate classical music among young people and in order to select a new public: I Solisti Veneti were the first orchestra in Italy to execute concerts in school premises. This activity had an enormous acknowledgement already in 1970 thanks to the victory in the music contest of Festivalbar obtained with more than 350.000 votes expressed by a young public. Filling a gap in the Italian music publishing, I Solisti Veneti, under the direction of Scimone, published a fundamental range of thematic catalogues and of "facsimiles" of the works of main Venetian composers (Albinoni, Bonporti, Tartini, Galuppi, Platti, Torelli, Dall'Abaco, M. Lombardini). Scimone cooperated with the Foundation Rossini of Pesaro in order to edit the opera omnia of Rossigni and devoted himself with passion to the training of young musicians. He was teacher of Orchestral Training at the Conservatory of Venice and, for 27 years, he was the Director of the Conservatory of Padua. Among the great number of awards he received, there are the Los Angeles Grammy Award, the Grand Prix du Disque of the Paris Academie Charles Cros (several times), the Award of the Académie du Disque Lyrique and about thirty other awards. Scimone received form the Italian President of the Republic the honour of "Cavaliere di Gran Croce" and a golden medal for school, artistic and cultural merits. For the moment he his the only artists who received by the Regional Council of Veneto Region the award of "Leone Veneto" with unanimous vote. Claudio Scimone and I Solisti Veneti were assigned in 2008 at La Fenice Theatre in Venice the Prize "A Life in music" by the Foundation Arthur Rubinstein, and which was assigned in the past to Rubinstein, Rostropovitch, Bernstein and, recently, to Pizzi, Raimondi, Mehta and Brendel. Many composers dedicated to Claudio Scimone and to I Solisti Veneti works composed just on purpose, starting in this way a new literature meant for 12 or more solo strings: among them there are Bussotti, Chailly, Constant, Corghi, De Pablo, De Pirro, Donatoni, Guaccero, Malipiero, Manzoni, Morricone, Scelsi and many others.